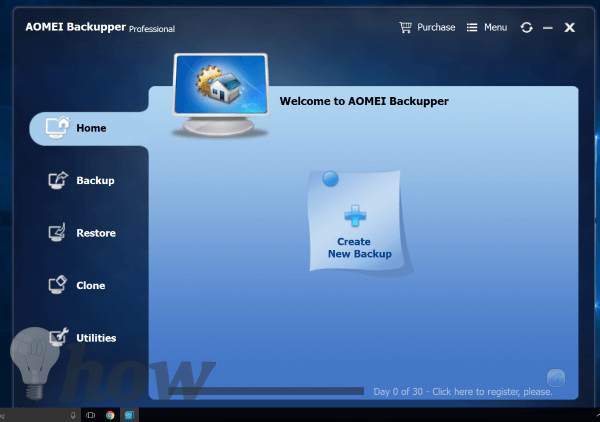 AOMEI Backupper is a a Windows backup utility. First, I have to say that the name “Backupper” makes me laugh. So bonus points there. Plenty of options for backing up and protecting your system, hard drives, and folders. AOMEI Backupper comes with a 30-day free trial. Just long enough for you to get all of your stuff backed up. User Interface is a bit dark. But that’s a personal preference thing. No Cloud solution option. No truly effective backup system is complete unless you have an additional backup copy offsite. As for the application. The interface is easy enough to use. When you first start the App, you get a great big “Create New Backup” option – full center, right in your face. So it’s extremely easy to figure out what to do next. Click on Create New Backup. Next, you’re presented with 5 methods for backing up your system. We’ll walk through them together. A system backup will backup everything on your hard drive or a single partition. Because it copies EVERYTHING bit-by-bit, this will be a big backup file (in backup terminology, the backup file is called an Image – I’ll be using the term Image going forward). According to HowToGeek, you should do a system backup occasionally but it should not be your regular backup strategy. In fact, you would restore a system backup only in a situation like replacing an old slow hard drive with a new SSD. You would take a System Backup of your existing setup with the old slow hard drive. Swap out the drives and then restore the System Backup to the SSD. 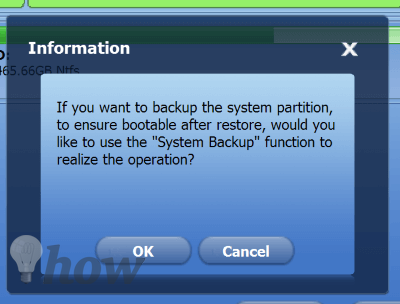 To access the System Restore Backup Options click on Backup Options in the lower left corner of the screen. Encrypting your backup – for when you’re concerned that you data might be stolen. Personally, I’m not too worried about encrypting my backup’s. Believe me, no one wants my private photos – I threw up a little in my mouth just thinking about it. 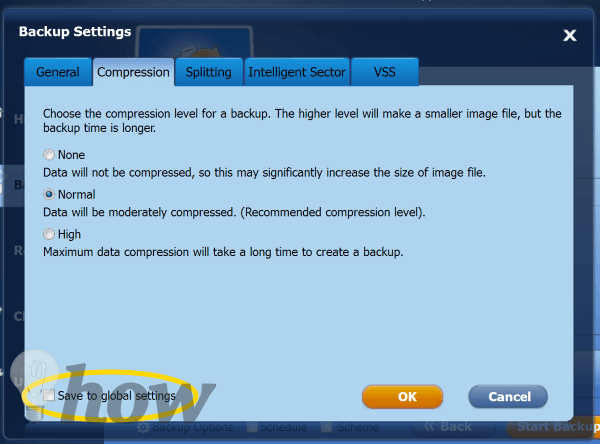 3 Options for compressing (or not) the backup image to make the overall image smaller. Splitting the backup into smaller files. Create an exact image of your system or only backup the parts of your hard drive that have data on them. 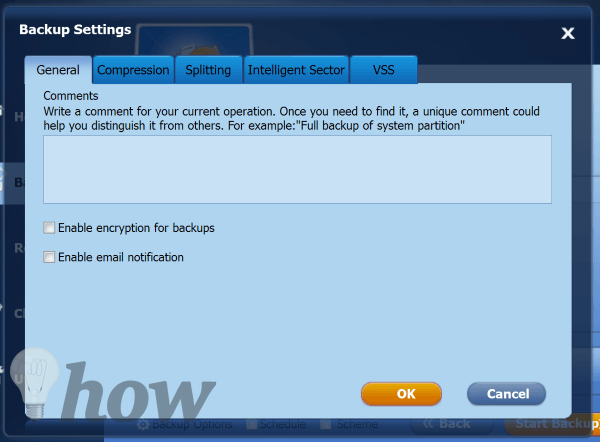 Select between 2 backup technologies – VSS (provided by Microsoft) or AOMEI’s proprietary backup solution. As you walk through the tabs making selections, you can have AOMEI Backupper save all these settings to a Global Settings file. But it’s not required, in case this is a one-off system backup and you don’t want to save these settings. A Disk Backup is very similar to a system backup in that everything on the hard drive will be copied. This is handy for when a hard drive crashes. But it’s still not ideal as your backup strategy. 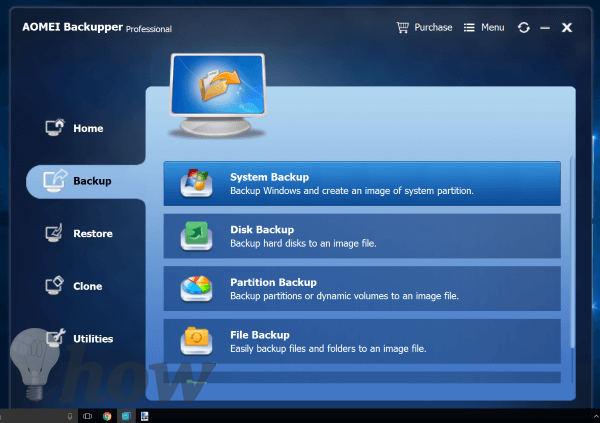 The backup option is the exact same as those available with the System Backup. You can even have AOMEI Backupper email you when the job has finished. To execute a Disk Backup, select the Drive you want to make a copy of. Then select the Destination drive. AOMEI notifies you if there is not enough space on the destination drive. It would be nice if there was an option to backup to a cloud service. Having the backup of your PC on another physical drive won’t do you much good if your house catches fire. 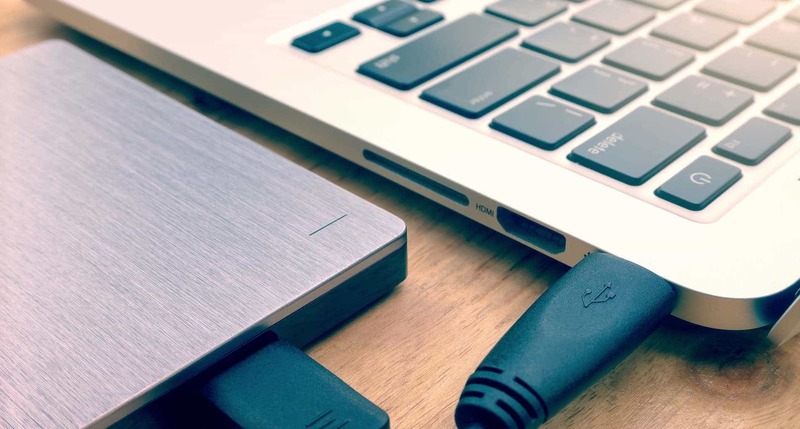 Even if you’ve taken the time to copy all of your physical photos to a digital backup, fires and floods destroy hard drives and everything on them just as quickly as physical photos. For example, you could have a 1TB hard drive in your PC. You can break that 1TB down into 4 250GB partitions and give them drive letters like D:, E:, F:, &G:. 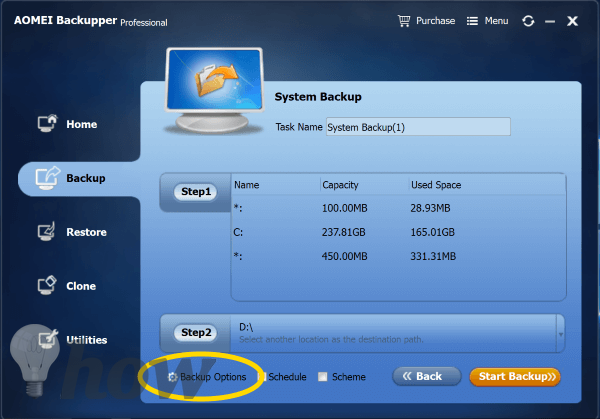 Using Partition Backup inside of AOMEI Backupper, you can select 1 or more partitions and back them up. AOMEI Backupper is smart enough to notice if you select a partition that has your system files included in it. It will then prompt you to do a System Backup instead of a Partition Backup. 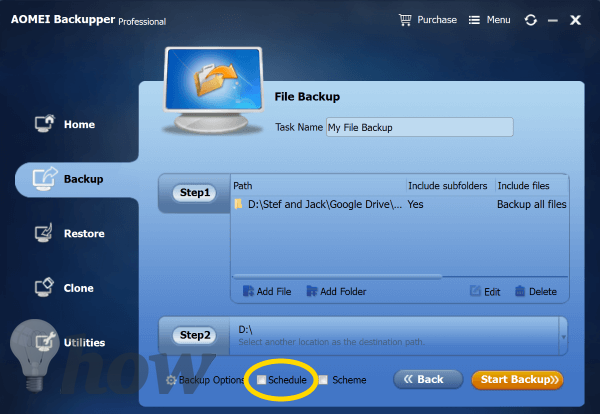 Backupper won’t stop you from backing up your system files as part of a Partition backup, it will just recommend that you complete the job as a System Backup instead. The Backup Options for a Partition Backup are the exact same as a System or Disk Backup. This consistency makes it extremely easy to get comfortable using the system. 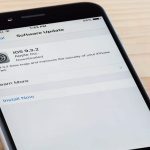 The File Backup is the portion of this App that you’ll be using on a regular basis to protect your most important files. Up to this point, most of the backup’s could be occasional, maybe quarterly or annual backups. But the most important Folders or Libraries to backup on your personal PC are your Documents, Pictures, Videos, and Music. Documents – This is the primary location for most of your personal files. This folder should always be included in your regularly scheduled backups. Music – If you’ve spent the time to convert your CD (if you’re as old as me) and spent quite a bit of money to build a library of music from Google Play, iTunes, Amazon, and others. Then you’ll most likely be bummed if you lose a hard drive and with it all that music you’ve collected. Photos & Videos – You would not believe how many emails I get stating that someone has lost all of their vacation, birthday, holiday photos because they weren’t backing them up. After a major catastrophe, people always miss their photos more than their most expensive possessions. Insurance can replace jewelry and electronics, but they can’t replace photos and memories of your life. So this folder/library must be included in your regularly scheduled backups. To open the Backup Scheduler, click on Schedule. It’s a bit deceiving because it looks like a checkbox, in reality, it opens the Scheduler window. 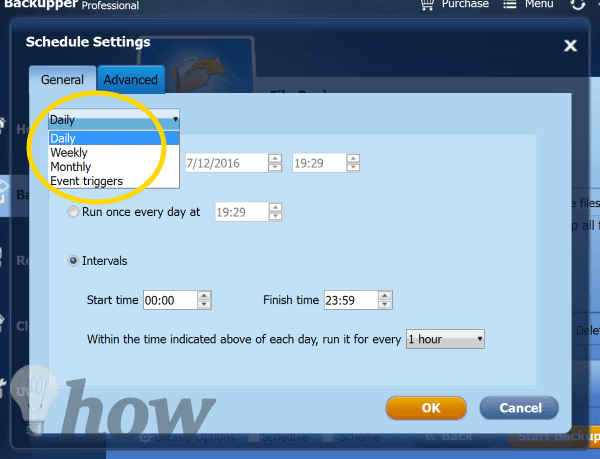 In the Advanced tab of the Scheduler, AOMEI allows you to use the Windows Task Scheduler or offers their own service. AOMEI’s service must be installed. I appreciate that AOMEI does not install the service by default and allows you to make the choice. 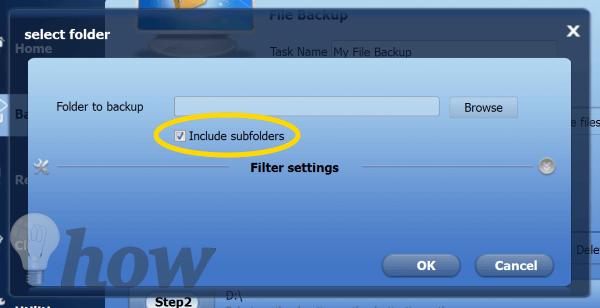 Inside of AOMEI Backupper, click on Add Folder, this will pop-up another window that allows you to browse for the folder you wish to include in the backup. There’s a checkbox on this screen that allows you to include subfolders, it’s the default so you don’t accidently forget it. By including subfolder you don’t have to go through and manually select all the folders that hold your Photos or Music. When you go to select a folder, Backupper opens the standard Windows file window so it should feel familiar and easy to use. Like I’ve mentioned a couple of time, this is the backup you’re going to want to complete regularly. Click on the Schedule link to open the Scheduler window. In the Scheduler you can select to do Daily, Weekly, or Monthly backups. 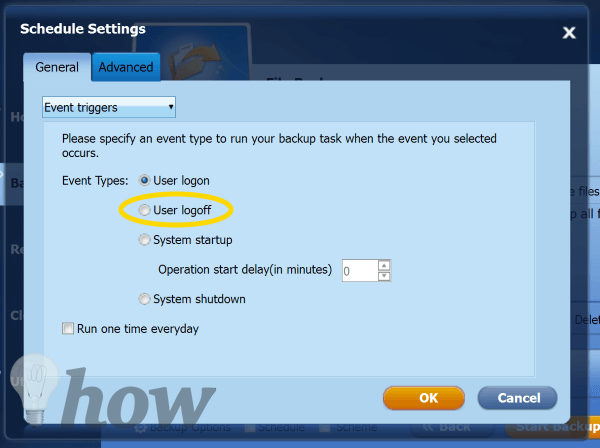 Use Event Triggers, you could even schedule a backup every time you log off the system. Not sure why you would need this, but it shows the flexibility of AOMEI Backupper. File Sync creates a duplicate copy of your folders in a separate location. I could see using this feature to backup frequently updated files to Google Drive, Dropbox, OneDrive or any other cloud-based offsite location.